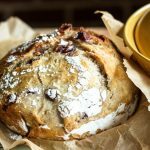 The best Cranberry Rosemary No Knead Bread bread studded with sweet cranberries and fragrant rosemary. This one is sure to be dubbed THE bread in your household, too! 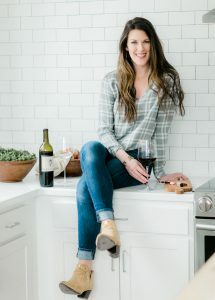 I announced this news via social media yesterday, and if you know me personally you may already know, but as of this week, I am a full-time recipe developer, food photographer, and food blog content manager. I’ll be dividing my time between Miss Allie’s Kitchen and another website, which I will announce in weeks to come. To stay in the loop, join my email list! My answer is yes. And truly, I am elated. I’m also scared as hell. I feel like I have spent my life in this box. This box compartmentalized my life. From ages 5-18 I went to school, following a schedule and concrete start and end times each day. College was filled with classes, sorority meetings, parties, study blocks, and projects, all which had deadlines and timeframes. My first job out of college was not necessarily a desk job; I worked as a farm manager, horseback riding instructor, and community relations manager at a therapeutic horseback riding facility. I was still expected to arrive on time, teach lessons at certain times, and feed a variety of critters at certain times of the day…TIME TIME TIME. After that position ended, I started working in office jobs behind a desk. I have had the pleasure of working for two fantastic companies, and I must say, I enjoyed the corporate world much more than I thought I would. Deep down, however, I knew this 9-5er just wasn’t me. I’m somewhat of a wild child, and wild things don’t do well in boxes. 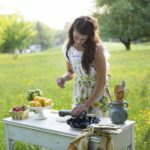 I started Miss Allie’s Kitchen with hopes that one day, very far down the road, I may be able to make a career out of blogging. It evolved out of a hobby, but I always operated with some intention for “someday”. For those of you that think I’m “lucky” (which, hey, maybe I am) I wish I could have invited you to watch me struggle for the past year. I spoke before about what it was like to be a Beginner Blogger, but ultimately, it’s a lot of work. It’s also work I happen to love, and through the past 11 months, I have felt this current pushing me along through the ups and downs, probably preparing me for today, Tuesday, April 25th, 2017. My second day of self-employment. The second day the box opened. I’m giving you this magic bread recipe today kind of because I feel like I’m operating in this magical fairyland. This new land still requires a lot of work (probably more than I had before, and of course there are deadlines), but it all just feels so open and wild. Now, this bread is wildly delicious, and with its folds & pockets of warm carb-y goodness, I want to apologize for going on and on about my new reality. I just want you to feel a part of this newness because you are. Your support and involvement has opened this door for me, so I want to offer this bread recipe as a thank you, too. 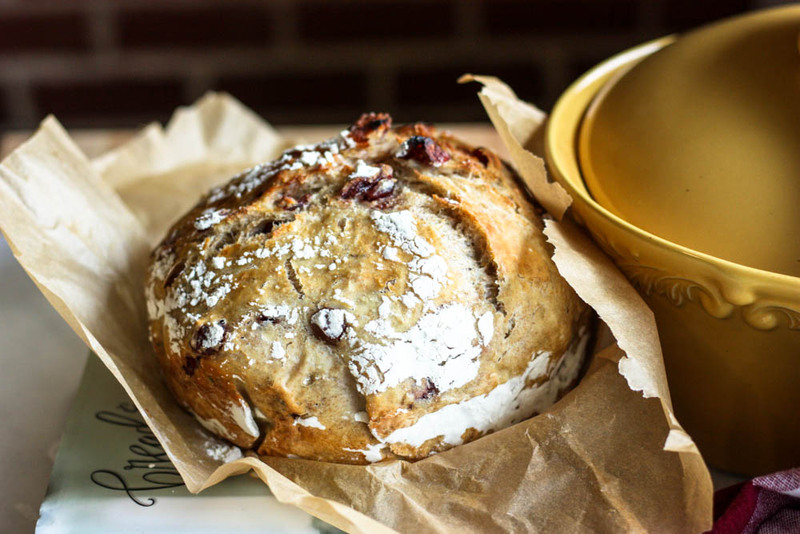 Because what says “thank you” better than a steaming loaf of cranberry – rosemary goodness? 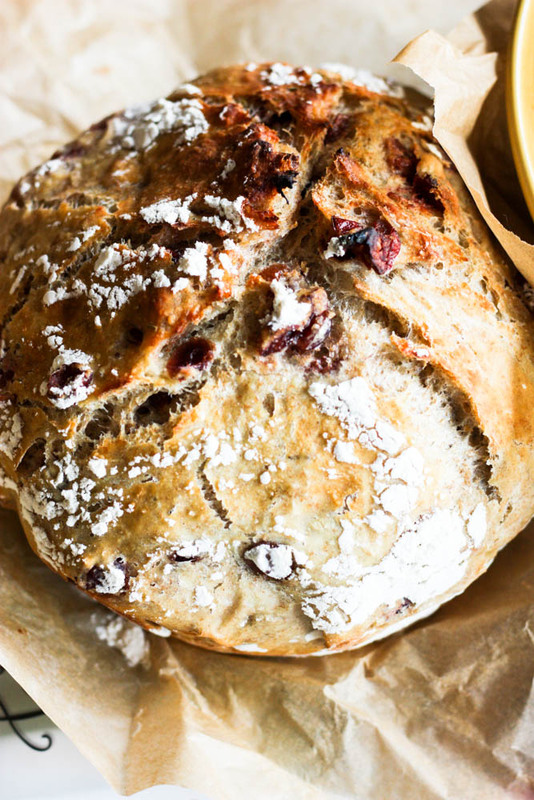 The best no-knead bread studded with sweet cranberries and fragrant rosemary. This one is sure to be dubbed THE bread in your household, too! 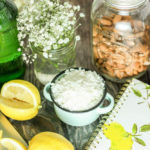 Measure the flour, salt, yeast, honey, rosemary, and cranberries into a bowl and mix them together with a whisk or wooden spoon. Mix in the water. Don’t get concerned if it looks a little chunky; it should be wet and gloopy. After this, cover your bowl with plastic wrap and you’re just going to leave it on the counter for 12-18 hours. Overnight is great. When you’re ready to bake, preheat the oven to 450 and stick the Dutch oven in the hot oven to heat for 30 minutes. Remove the Dutch oven, line it with parchment and place the dough on it. Cover it with the lid and bake for 30 minutes. Pull the Dutch oven out, take off the lid and allow it to bake for 15 additional minutes so the crust gets golden. I suggest serving with a swipe of honey butter. i don’t know if i’m more excited for you or for this recipe…PAH JUST KIDDING I’m SOOOO stoked for you!!!!! you’ve worked so hard & you’re going to excel in this new chapter in your career!!!! can’t wait to see how it unfolds. 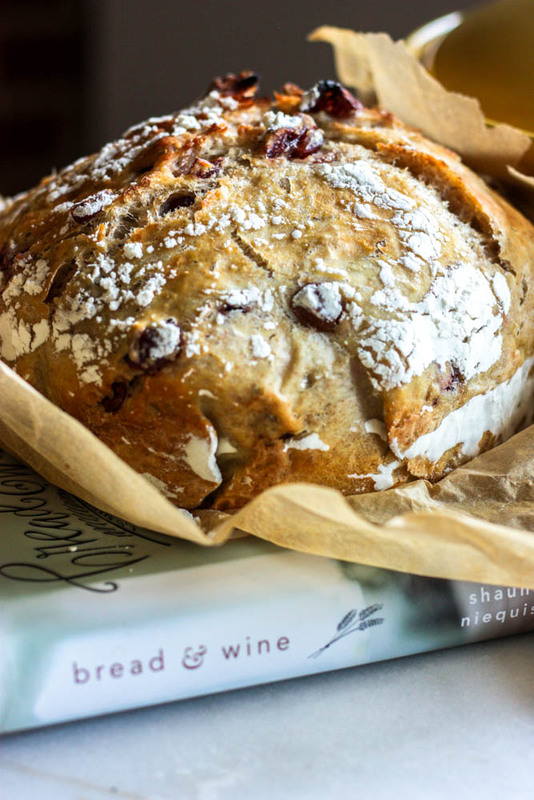 but really, thanks for giving me a baking project for the weekend…crusty rosemary & cranberry bread needs to be in my life. Need this! I have been doing a lot of research in bread baking lately and this looks like something I’d add to my ‘baking to do list’! Pinned already 🙂 and again, I think i’ve said this three times already CONGRATS! So excited to see how everything works out for you! I am so so so excited for you Allie; it’s amazing to me to see how your journey has progressed so quickly with so much hard work. 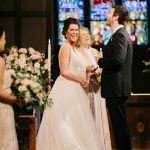 I’m thankful that God uses opportunities like these for me in blogging to step out in faith and trust Him more, because they can be incredibly amazing (when you don’t know what’s going to happen next). Hoping to make this today! You go, girl! Congratulations on your new venture! And this bread, goodnight. Sounds wonderful! Wow, exciting news! Wishing you all the best on this next chapter. I’m sure there are many of us out there who hope to get to that point as well, where we can make what we love the thing that earns us our living. BTW, the bread looks awesome, might have to try it. We made the bread, it really was magic! Love the fact that it just sits there overnight, a really simple method of producing tasty home made bread. The only “problem” was that it went too quickly in our household – might have to make double next time.